“The information will always be there. It is up to you – what do you want to learn? Sometimes you will ask a question and I’ll answer your question but I go into a lot of different things. But it always comes back to that question. With us Native people it is not just a straight answer – there are stories behind everything and we have to know our stories.” – Carolla Calf Robe. 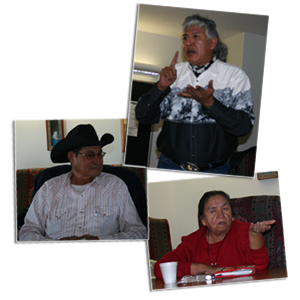 Four key topics arose in our interviews with the Kainai Elders: culture, knowledge, spirituality, and the environment. You can read more about each of the Elders interviewed in Wisdom (blue).